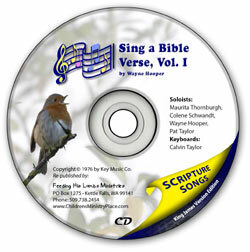 Four talented vocalists sing 13 songs each, taking turns in rotation to give you a listening variety. You will hear the singers in this order: Maurita Thornburgh (soprano), Colene Schwandt (soprano), Wayne Hooper (baritone), and Pat Taylor (soprano). Calvin Taylor provides the sparkling accompaniment on the piano, harpsichord, and celeste.